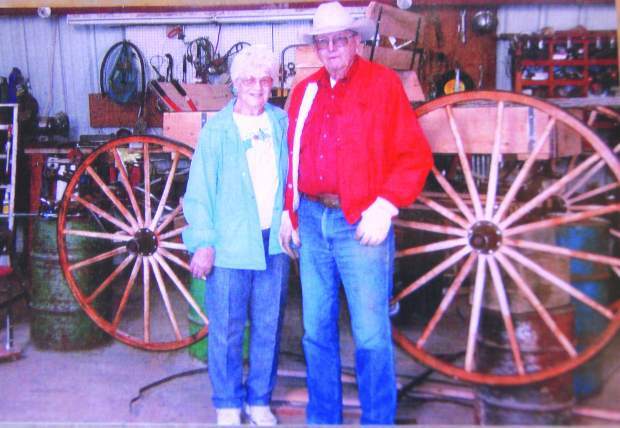 Virginia and Bob pose with the second restored buggy. Bob built the buggy by combining different pieces given to him; only the wheels were purchased. 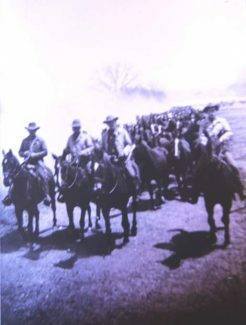 Bob (2nd from left) and three other soldiers move about 300 head of horses to a different pasture in 1942 or 1943. Frank P. "Bob" Robinson, Broadus, MT, and his sweetheart Virginia Lee (Rumph) "were married 70 years this September," he proudly reports. "I've got the best wife in the world," he adds. "She's my secretary, does all the letter-writing. I'm allergic to pencil dust." "We're horse people, that's been my life," says Bob. 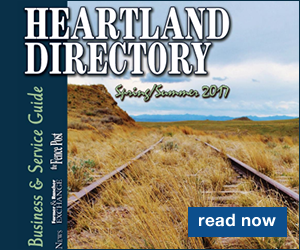 As a young man, Bob cowboyed for his dad George Robinson and uncle Edd Robinson who ranched in Northeastern Wyoming. The two men ran "a lot of horses" and also broke horses for neighboring ranchers Dorrs, Renos and others. "The whole family" worked together as a horse-training crew. "Every time we got a nice bunch broke, dad would sell them and run in a new bunch to break," he says. 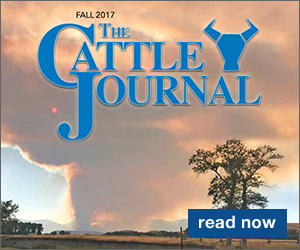 Seven times, Bob helped drive cattle and horses north into Montana for his uncle, his dad and other ranchers. Bob's uncle Edd met a tragic end in 1941 when he was thrown from his mount, then trapped under the horse, who broke its neck and died. Edd's leg was broken and he tried valiantly to escape – the coroner estimated he lived about 30 hours before succumbing to exhaustion, thirst and the elements. Bob met Virginia, a ranch girl, at a country dance in 1940, at the schoolhouse 26 miles up the river from Broadus. They were married two years later – he 24 years old, she 22. In January of 1942 Bob enlisted in the army in Fort Robinson, NE, a remount outfit. The army was mechanizing and gathering mounts from across the country to re-issue them. 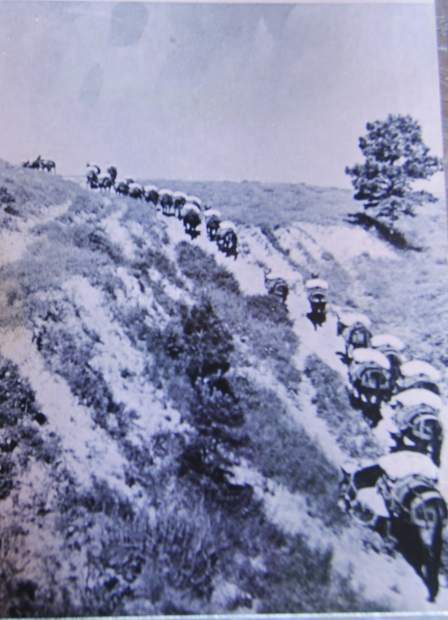 Many mules went to Burma and some horses headed to the coasts for beach patrol. At one point in his service, 11,000 head of horses and 7,000 mules were under that outfit's charge. Bob's beloved horses kept him from going to battle during World War II – but just barely. "I was on the roster to go to India. I was on duty at the stud barn, and there was a little stud there I always wanted to ride, this other fella was having trouble with him. I got him workin' real good and looked up and there was the captain," recalls Bob. "I thought I'd get my tail eat up. I got off and saluted him and he said 'Get on him and do it again.' I had him working like the button on a privy door," Bob smiles. "The next morning I was made sergeant and had charge of all the rowdy studs. All the studs the boys didn't want to ride, I rode. They were probably better hands than me, but I happened to be there at the right time," Bob says humbly. Bob's discharge papers, dated December of 1945, reported his rank as a Horse Breaker and Stable Sergeant. Out of the service, Bob worked at the LO ranch, 45 miles north of Broadus, on Mizpah Creek, where he rode and broke horses for four years. 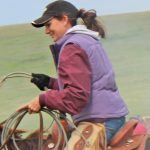 Then they leased – and later bought – "the prettiest little place in the country" 10 miles north of Hammond, MT, where they "nearly starved to death" ranching. Bob also worked for a cattle buyer, traveling all over Montana and into Wyoming and South Dakota. A good horse was never far. Bob enjoyed roping in local rodeos but the only way he could afford it was to train a horse, rope on him in the rodeo, and sell him there. "I'd load him in the trailer, head to the rodeo, and plan to pull an empty trailer home." 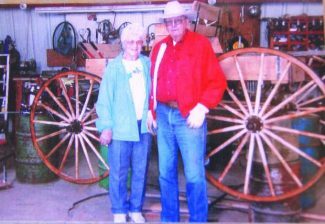 Later Bob and his bride bought a little place just outside of Broadus, where they remain – independent as ever. Bob and Virginia were blessed with four children – Anita, Dennis, Gordon and Gwynne. With glossy eyes, Bob tells that only Dennis is still living. Bob's grandchildren – scattered to the four winds, are a source of pride. Great grandson, team roper Britt Williams, Hammond, MT, competed in the 2010 National Finals Rodeo. Bob enjoys working in his woodshop and gifting handmade crafts to his grandchildren and great grandchildren. "I don't do much, magazine racks, bookshelves, just simple things." A neighbor is helping Bob put together a display case for Britt's trophy buckles. "I just hand him the wood, he does the rest," says Bob with that never-ending humility. He recently refurbished a neighbor's buggy, and has another one nearly complete from old pieces given to him. Yep, horses have been his life. That gentle, modest spirit surely inspired many a horse and many a man these past 93 years.